Sony can be described as anything but a new player in the superzoom market. As early as 1997, they released a digital still camera � the Mavica MVC-FD7 � that boasted a 10x zoom lens, and the next few years saw the introduction of numerous 10x and even 14x zoom models, some of which also featured the Steady Shot image stabilisation system lifted directly from Sony's camcorder line. 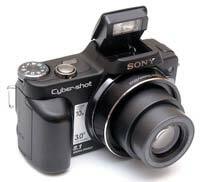 However, after the turn of the millennium, Sony focused on producing other types of digicam, and only re-entered the superzoom segment in 2005 with the announcement of the Cyber-shot DSC-H1. Since then, they have produced an entire range of H series digital cameras, the newest of which, the Cyber-shot DSC-H50 and the Cyber-shot DSC-H10, were announced at the beginning of this year. We've already reviewed the DSC-H50, and now it's time to have a closer look at its little brother, the Sony H10, whose headline features include compact dimensions, an 8-megapixel sensor, a 10x zoom lens, a 3-inch LCD screen, Super Steady Shot image stabilisation, Dynamic Range Optimisation, Face Detection and a wide range of manually adjustable settings. With a street price of of less than �200 / $300, the Sony Cyber-shot DSC-H10 is certainly good value. Zoltan Arva-Toth discovers if it's also a good camera. The Sony Cyber-shot DSC-H10 is a fairly compact digital camera, which is no small achievement considering the 10x zoom lens it sports. It is, however, somewhat bulkier than its most obvious competitor the Panasonic Lumix DMC-TZ5, due to the Sony having a prominent pop-up flash and a deeper hand grip. Speaking of the grip, at first it seemed like an afterthought rather than an integral part of the body, but I got used to it relatively quickly. Unlike the TZ5, the H10 has a plastic body, which is again something that didn't make it feel extremely attractive at first but didn't prove an actual annoyance in real-world use. The H10's main selling point is its stabilised, 38-380mm equivalent, f/3.5-4.4 Carl Zeiss Vario-Tessar zoom. The telescopic lens barrel has a rather large non-retracting element which occupies much of the camera's front panel. When you power up the DSC-H10 the lens extends, but not as far as you would expect from such a long zoom. Most of the zooming apparently takes place inside, as the full length of the lens doesn't change all that much as you go from the wide end to full telephoto. An important deficiency is the lack of an iris diaphragm � meaning that in the case of this particular camera, the term 'stopping down' only refers to the engagement of a built-in neutral density filter. In consequence, you only have two 'aperture settings' at your disposal, irrespective of where you are in the zoom range. Another corollary is that stopping down hasn't the slightest effect on depth of field, which can thus be only controlled by changing the focal length or the camera-to-subject distance when feasible. The camera comes with a lens hood, which is supposed to be put on, using the included adapter tube, whenever shooting backlit subjects. The Sony Cyber-shot DSC-H10 only has a handful of external controls. On the top plate, you will find the power button, the shutter release and a conventional mode dial. The available shooting modes include a full manual mode � which puts the Sony ahead of its direct competition, although as mentioned earlier, you don't get much in the way of aperture control � a P mode with no Program AE Shift function but still a lot of adjustable settings, a Full Auto mode marked with a green camera icon, a High ISO mode that doesn't quite belong on the dial, eight scene modes out of which four are directly accessible from the dial with an additional four available via the menu in the SCN mode, plus a movie recording option. Movies can be either 320x200 pixels at 8fps or 640x480 pixels at either 17 or 30fps. The optical zoom cannot be used while filming, but can be preset to any available setting beforehand. Sound is recorded, and in excellent quality to boot. Film clips can be colour, black and white or sepia toned. Exposure compensation, the metering and focusing mode and white balance can be set for movies as well as stills. You can also use image stabilisation. The oversized back-panel LCD monitor (which, I have to admit, is very nice to use, being excellently viewable from an extremely wide angle and even in direct sunlight) has caused the designers to make the rear controls � the Playback button, the zoom rockers, the Menu and Home buttons and the four-way pad � as small as possible. Surprisingly, only the first one of these � the Playback button � has turned out to be too small in actual use, sometimes making it a frustrating experience to switch to review mode. The other controls worked well. The rocker buttons are used for zooming in and out and are adequately responsive. While zooming, a horizontal bar appears on the LCD showing where you are in the zoom range � not only graphically but also numerically. The latter doesn't mean the actual or the 35mm equivalent focal length but the zoom ratio being displayed. So it will read '1x' at the wide end and '10x' at full telephoto. In-between values are displayed with one decimal place precision. The Menu button is used to call up a graphical user interface, which lets you modify a legion of settings, particularly in P and M modes. Image resolution can be set to 8, 5, 3 or 0.3 megapixels at the native 4:3 aspect ratio of the sensor, 3264x2176 pixels in 3:2 format or 1920x1080 pixels at the 16:9 ratio of wide-screen television. Available drive modes are single shot, continuous drive at ~2fps for a maximum of 100 frames or AE bracketing in 0.3, 0.7 or 1EV increments. Colour can be set to normal, vivid, natural, sepia or black and white. 'Normal' is likely to be vibrant enough for most users. ISO sensitivity is either auto or manually selectable from full values between ISO 100 and ISO 3200. 'Auto' limits itself to the ISO 100-400 range, but may pick in-between values � such as ISO 125 � that cannot be selected manually. If you want to allow the camera to use high ISO values too, you have to turn the mode dial to the High ISO setting (and put up with the limitations this shooting mode brings along). Ambient exposure compensation can be set between -2 and +2EV, in 1/3 EV increments. The metering modes offered by the Sony Cyber-shot DSC-H10 are multi-area, centre-weighted or spot. It makes sense to use either of the latter two in conjunction with centre-point AF. Focusing modes are multi-point AF, centre-point AF, spot AF or manual focus. In multi-point AF mode the camera decides what to focus on, which is usually the closest object in the frame. Centre-point AF and spot AF are similar, the difference lies in the size of the AF frame. Manual focus isn't what you would think it is: you can only set the focus to one of five predefined subject distance values, including 0.5m, 1m, 3m, 7m or infinity. Nevertheless it's useful when you want to do street photography with the lens fixed at the wide end � you simply set the subject distance to 3m and shoot away happily, knowing that everything between less than 2m and infinity will be in focus. This speeds up the camera as it doesn't have to engage the AF, and increases the chances that you'll capture the moment. White balance can be set to auto, sunlight, cloudy, 3 different types of fluorescent tube, incandescent and flash. There is no custom WB option, which is a pity as neither AWB nor the presets give consistently good results in artificial light. Flash exposure compensation, similarly to ambient EC, it can be set between -2 and +2EV, again in 1/3EV increments. An advanced feature, but you'll rarely need it as flash exposures are generally very good. Red-eye reduction is either auto, on or off. It should really have been made available via the flash mode button (right arrow key). Contrast can be set to DRO, normal, or manually biased towards more or less contrast. DRO is the default setting, and rightly so: the letters stand for Dynamic Range Optimisation, which automatically lifts the shadows to prevent them from coming out too dark when photographing a contrasty scene. This is done in a way so that it doesn't affect the midtones or the highlights.� Sharpness allows you to tune the in-camera sharpening to suit your preferences. Steady Shot image stabilisation allows you to specify if you want it to kick in only when you half-press the shutter release button or to be always on or turned off. 'Always on' drains the battery quickly, so it is not really recommended. Turning it off might be a good idea when the camera is mounted on a tripod, so that the stabilisation system won't cause motion blur by trying to counter vibration that is not there. The graphical menu is also where you can reach the Setup screens from. Face Detection is also accessed from this menu, but this option is only available in Full Auto mode and one of the scene modes. As you can imagine, such a vast array of settings couldn't be squeezed into a single screen, so in the shooting modes where the majority of them are available, it may take some time until you find the one you want to modify. To add insult to injury, the menu doesn't wrap, so you can't just jump from the end to the top � you have to work your way back. The four-way pad on the rear of the Sony Cyber-shot DSC-H10 provides quick access to a few settings, including the macro mode (left), the self-timer (down), the flash modes (right) and the various display options (up). The macro mode is either On or Off, and when set to On, it allows you to get as close as 2cm to your subject, provided you don't zoom in much. The self-timer delay can be set to 10 or 2 seconds, and can of course be turned off. The flash modes include Auto, Slow Sync, Forced On and Forced Off. Red-eye reduction is available, but only from the menu. The display options allow you to choose how much information you want to be displayed on the screen. Thankfully, this can include a live histogram. A grid overlay is also available, but again, you will have to enter the menu � this time the SETUP menu � to enable it. In operation, the DSC-H10's performance is respectable. Startup takes less than two seconds. A minor annoyance is that if you forget to take off the lens cap, you are prompted not only to remove it but also to switch off the camera and power it on again. (If you, however, have turned on the camera only to review your shots and not to take pictures with it, you may proceed by pushing the Playback button.) Once ready to shoot, the� H10 proves to be a responsive camera. Auto-focus is surprisingly fast at wide angle, though it slows down noticeably at telephoto. Once focus lock is achieved, shutter lag isn't a problem. It is only in Playback mode when you encounter some slowness: photographs are retrieved in two 'waves', first you get a rough picture that cleans up in about a second. It isn't terribly annoying, but you have to get used to it. Flash recycle times aren't bad either, with the pop-up unit being able to fire again in less than two seconds after a full discharge, owing to the compact but robust proprietary Li-ion battery. Speaking of the battery, it slides into a compartment whose door is on the bottom plate and houses the memory card too. The Sony Cyber-shot DSC-H10 stores images on Memory Stick Duo and Memory Stick Pro Duo cards, but won't take the older and bigger Memory Sticks. Both the battery and the card are prevented from accidentally falling out of the compartment, even if the door is open. However, this does not mean that they can be changed when the camera is on a tripod � unfortunately, the door hinges are too close to the tripod socket. The socket itself is made of metal, so you needn't be afraid to use it on a regular basis. 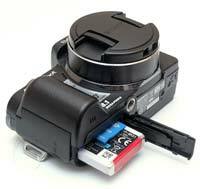 The DSC-H10 comes with a printed quick start guide and a detailed manual on disk. The latter is, thankfully, a fully cross-referenced PDF document, which makes it easier to navigate than most other camera guides. PhotographyBLOG is a member of the DIWA organisation. Our test results for the Sony Cyber-shot DSC-H10 have been submitted to DIWA for comparison with test results for different samples of the same camera model supplied by other DIWA member sites.